A gas station in Spruce Grove has sparked online debate over a controversial message. 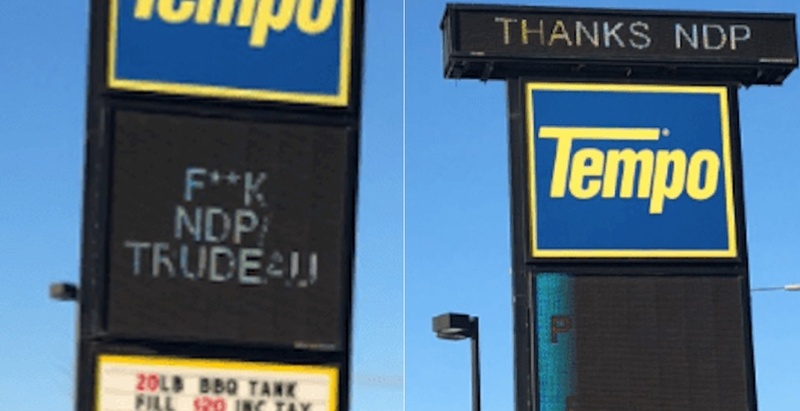 The Tempo gas station was running “F**K NDP/TRUDEAU” over its light-up display on the side of 1 Avenue E in the Edmonton suburb. The message comes shortly after the provincial government instituted a carbon levy increase from $20 to $30 per tonne on carbon dioxide emissions on January 1. Federated Co-operatives Limited, the federation that owns the Tempco brand and licenses its use out to independent retailers – including the gas station in question – has since asked the owner to remove what was written, according to a statement sent to Daily Hive from Cam Zimmer, the communications and public relations manager for Federated Co-operatives Limited. “Yesterday, Gas 4 Cash, an independent business in Spruce Grove, Alta., with a marketing agreement to use the Tempo brand, posted a profane message on an electronic street sign,” the statement read. According to the statement, the owner complied with the request and removed the message from the display, but not before people on both sides of the debate began chiming in via social media. I hope this Tempo gas station loses customers for this, but then they will just blame it on Rachel Notley and Justin Trudeau, because Conservative supporters always get it wrong.